My colour bit on how Negredo made an emphatic contribution to the big Boro ‘striker lite’ debate that has raged all week and answered his critics in style. And here’s my “did your guide dog do these marks” player ratings from Leicester. Guess who got top marks. 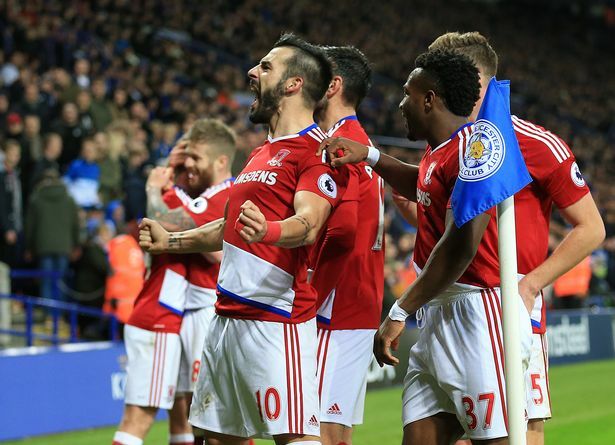 Plus here’s our digest of an entertaining and enthralling 2-2 draw, an adamant Aitor on how Wes Morgan ‘fessed up to the push on Chambers for the first penalty and all round nice bloke Claudio Ranieri in rare opposition manager in good grace shocker and admitting Boro were the better side. That should be enough for you to get on with. Good post Ian, ……and as I have been bleating on about wins also, Sunderland have won three of their last four, one more than us now. The hull game is now a must win at all costs, no messing around, no tippy tappy . . .go for it. Dangerous sentiments in these woods Allan. You could get sentvto Coventry or worse for comments like that. Beware of the Ultras – be afraid! Be very afraid! If you look at the teams that were struggling and have seen a resurgence, it is not a result of gaining a “good point” but that they have won a few games. We are now into a “must win” phase of the season if we want to avoid slipping Dow n the table. Dont want to be a harbinger of doom gloom and ubiquitus moaning Steely, but there aint that much more slipping down we can do. On the up side I am convinced we’ll win tomorrow night by at least 3 clear goals. If Sunderland can beat Hull then we MUST be able. Before kickoff tomorrow night we will find out who we have drawn in the 3rd round of the FA cup. Everton drew with Man Utd today. UBT! Where did the name Holgate End come from? AV? Is that a common last name in the UK, for example? We must win tomorrow. AK wil keep the players feet on the ground. I hope for three points – don’t mind the score at all. I think Holgate was part of the old Middlesbrough General Hospital at the top of St Barnabas Road and the ground backed onto Holgate, hence the Holgate End. I remember my grandfather saying Boro will tackle them, they’ll take them to the General and if they don’t survive they’ll pop em into the cemetery over the road. Ironically he’s buried in there! No doubt someone on the blog will have a more erudite definition. This tells a sorry story of Middlesbrough of old and “Holgate”. Typical Boro sadly. Thanks for that, I remember that blackened and stained Victorian building and the Broomlands building too. Typical, you are right. Thanks for the link RR. Very interesting read. the Holgate tale is in no way strange, just a typical Victorian story, that’s what those pillars of rectitude did, all over the country, including small towns, and of course London. So we can refrain from scratching our sores. I think Holgate was also an old peoples home finally. I feel sure I have muddied the water. Vic, do you have any info on which player’s contracts run out at the end of this season and if they are going to be renewed? Or if any other clubs are intertested in them? Catch this on iplayer, not your usual run of the mill football documentary. Cheers, mates. I have read a lot about the Boro team and the town (and visited the area about 30 times) but this was new info for me. Had seen the hospital but did not know the connection. I love this club. Up the Boro! Ever been bitten by a shark AV? Adama Traore gets an article about him in the Torygraph. he is sixth in Europe for dribbles this season. Ahead of him at the top of the table is Neymar. Second and third are Zaha and Hazard, both fixtures in their teams. The key thing for us is his end product, that is what marks out the top players. The good thing is he has the speed and dribbling skils, the coaches can work on the rest. Good piece in the Gazette as well – seems he is fully aware (I suppose why wouldn’t he) that he needs end product to go with his skills. One of the less heralded bonuses of being the Premier League is all the snippets of additional coverage you get, though we’re spoiled already with what we get via the Gazette and the blog. Tonight feels like a huge game all of a sudden. The weekend’s results didn’t go too well for us. Let’s hope tonight is a rerun of the Bournemouth game rather than the Watford one. There’s every reason to be hopeful. We haven’t put in a disappointing performance for six or seven weeks. WE are getting better and the stats prove it. Must have felt like a defeat at Leicester as we got 300 together – usually reserved only for a defeat. And 400 and 5 00 need a n FA Cup defeat to Cardiff (of Championship) on the sixth round. Remember those days? GHW got the 300 gong – I don’t think there is any Trabbies left in Europe? My concern for tonight is whether the match will start or finish, as the weather forecast is mist early evening then fog from 8 – midnight. In some cases it is persuading them to kick to somebody with the same colour shirt or to do it at the right time. When he was breaking in to the ManU team, Giggs used to drive SrAlex mad because of his lack of end product. If we can coax Traore to improve that we may have a real find on our hands and got the better of the deal with Villa. The forecast does look grim, just have to keep our fingers crossed, I like points not games in hand. If it is called off I feel sorry for the fans especially those travelling from Hull and the Diasboro.. It isn’t like a foot of snow or a frozen pitch where you can make an early call. You can only travel in hope and the driving will be grim as well. Does anyone know what the procedure is for inspections etc? Not a hint for AV, honest, sort of. The BBC forecast has changed since first thing, with mist being forecast in the evening and the fog developing over night, Met Office still has fog around 2100 hrs. Trouble with fog it can be clear at kick off then gradually creep in during the match and I don’t believe it can be forecast at what time it will arrive and how thick it will be, it will be up to the officials whether the match can be completed. Thanks for the Holgate link. Very sad story. The revelation at Leicester was just how dangerous and effective Ramirez was in coming from the left in one-on-one situations. He could be our John Robertson, a talented midfielder player, somewhat injury prone through having to hack his way through the midfield thickets, being given the time and space to work his magic out on the left. It was Cloughie’s most transformative tactical switch at Forest. Without it probably no Second or First Division titles. And certainly no successive European titles Robbo scored the winner himself in one final, and laid one on a plate for Trevor Francis in the other. Gaston could be a star in that position for years to come. Ran a check on both BBC and Met Office forecasts. The probability is that there should be no problem but you can’t rule anything out. I have just checked the forecast. Come on here and should have known there were enough people as sad as myself who would have done for us. Good to hear Derry and Belfast will have mild weather. Lets hope a depression sets in over the Humber during the evening. Agree with Ian preferring points in the bag but a postponement would be better than a draw or defeat if the weather turned the game into a farce where anything could happen. Also agree about Traore, he has the skill and attributes its all about coaching the positional awareness of himself and team mates into him and picking the right ball to play, when and with accuracy. If we can do that the discussions will change to how long we can hold onto him for! Assuming the frost doesn’t win I’m optimistic for a convincing Boro win. We need to be picking up 3 points not draws to put some distance between us and the bottom three. West Ham and Swansea’s slide (along with Leicester arguably) and Hull’s plight are helping us greatly but we need to help ourselves and tonight is as good an opportunity to push on as we will ever get this season. Unfortunately I’m 3,500 miles away headed to a meeting and then the airport so will miss the event but hopefully can watch the recording tomorrow afternoon when I get back. Assuming the weather doesn’t scupper the game, I’m predicting one nil to us. Negredo to force another one over the line. I don’t think the frost will be an issue because we have under soil heating. It is just a matter of keeping an eye on the forecast as it changes during the day and hopefully the fog will hold off until after 10 but preferably until during the night so everyone can get home safely. I suspect we will see a bit more of Captain Leadbitter tonight , coming on mid-way through the second half and inspiring the boys to up the tempo to hit three goals after a fairly lacklustre first period as we eventually win by three clear goals after a mist penalty in the fog. Does under soil heating produce it’s own microclimate where the warm moist air rises and hits the cold ambient air and create localised mist and fog? And then there is also the possibility of frozen approaches around the Riverside. In a week where we’ve had the suggestion that we can draw our way to safety – mathematically bonkers quite apart from the psychological factor in terms of morale if we can’t win games – Hull is a very important game to win. But it’s not one where we should be sending Valdes up for corners if it’s a draw towards the end, there are a lot of points still to play for. Palace previously lost six in a row, but their win this weekend suddenly shot them up three places and two points above us, showing the dramatic effect that wins can have, giving the whole club a massive lift*. From being dead and buried Sunderland are suddenly breathing down our necks following three wins out of four, and to put that in context, three additional wins (Stoke, Leicester, West Brom?) would have placed us on 18 points and looking up towards the top seven by beating Hull. Aitor could be level with Jose! We have to win more games. I think Hull will see this match as one of their more winnable games just as we do. They played well here last year, and it’s a six-pointer for them as well. They won’t expect to dominate, but they will be fired up and competitive. They have recently beaten Southampton and drawn with West Brom at home, they are not bunnies. We will need to show them the respect of concentrating and playing with the same intense discipline as we did against Chelsea. We will need to cover Snodgrass much better than we did Moses on our right. A lot will depend on us having Ramirez and Traore ripping into them, the full backs getting forward and Negredo finishing as decisively as he did at Leicester, and this is a perfectly possible scenario. Score early-ish and we could run out a comfortable 2-0 or 3-0. But we need to be patient and hope the crowd doesn’t get too anxious if we don’t score first half. While the rest of the squad were doing circuits of the pitch Bernie would be doing the same in the six yard box. Offside would be banned. As for tonight, I would expect 2-0 in front of 29,986 supporters, 1750 from Hull. Goals from Negredo and Traore. You saw it totally wrong here first! The overall point is that every point is crucial when a ‘less than a point a game’ average might well be enough to see us hit our targets this season. So, I’m not sure we should be so quick to dismiss hard-earned points as not worthy. It obviously isn’t ‘must-win’ but a win would certainly be handy tonight. Like you say, more for psychological reasons than anything – you could see the confidence growing in the team in the 2nd half at Leicester – they’ll expect to win tonight and it’ll be a big blow if we don’t. I predict a 2-0 win. Gibson and Negredo. Boro have come a long way if we are more worried about the weather than the opponents! I don’t know if it is a good omen, but anyway I say a 4-1 home win. Gibbo, Gaston, negredo and Rhodes (!) scoring. They hit a goal at 87th minute from a corner. Happy days. I don’t think we do have under soil heating as it happens. Again no predictions from me, I always get them wrong anyway. I think this is one of the fixtures that should have been discounted in terms of the “walk up price” cannot see more than 27500, but then maybe Ian had a look at the seating before he posted his 29986. Hull will not roll over so we need to be at our best. It is one of our mini league fixtures so it is more or less a must win game. We are not on the point per game ratio achieved by drawing all our games, that BP said is OK. Only teasing BP!!! Hopefully the weather will not be used as an excuse and AK gets a big thumbs up.